6:00 p.m. local time. A/1C William Beatty saw two civilians looking and pointing at something in the sky. Beatty then also looked to the sky and saw five or more objects that he did not recognize as airplanes. 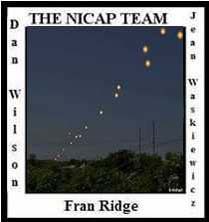 They were long and slender silver colored objects flying in a box-like formation with a leader in front. The objects were traveling to the south at a high rate of speed with no sound or exhaust visible. Beatty watched the object for 15-20 seconds before they disappeared. Beatty was steadfast in stating that the objects were not conventional aircraft.